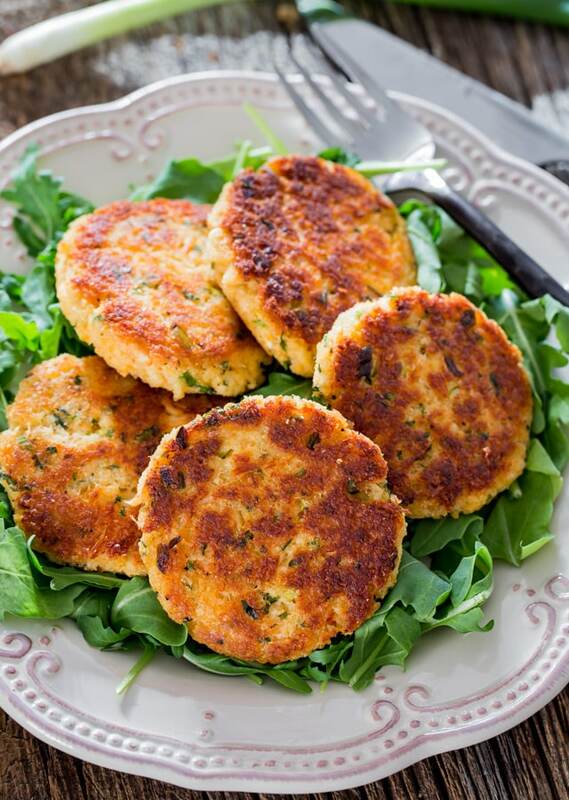 These delicious and Easy Crab Cakes are simple to make, ready in no time, crispy on the outside and tender on the inside. These succulent pan-fried crab cakes are fast, easy, loaded with flavor and won’t crumble when you fry them. Are you guys all ready for the holidays? Have you even started Christmas shopping? I did, for one person only, but hey it’s a start! Though I will tell you one thing. I am ready to put up my Christmas tree, or two. I have two trees and I’m tempted to put them both up. I’m a bit crazy, I know, but I love Christmas! So you know what’s great when you put up your tree, make some mulled wine, put on the Christmas music and go nuts. That’s what I’m going to do. But today I was in the mood for some crab cakes and these crab cakes here are all about the crab. Lots and lots of crab. Such an easy recipe too, and if you’re like me and love your crab cakes, you’ll probably eat these all by yourself. But I’m not here to judge! 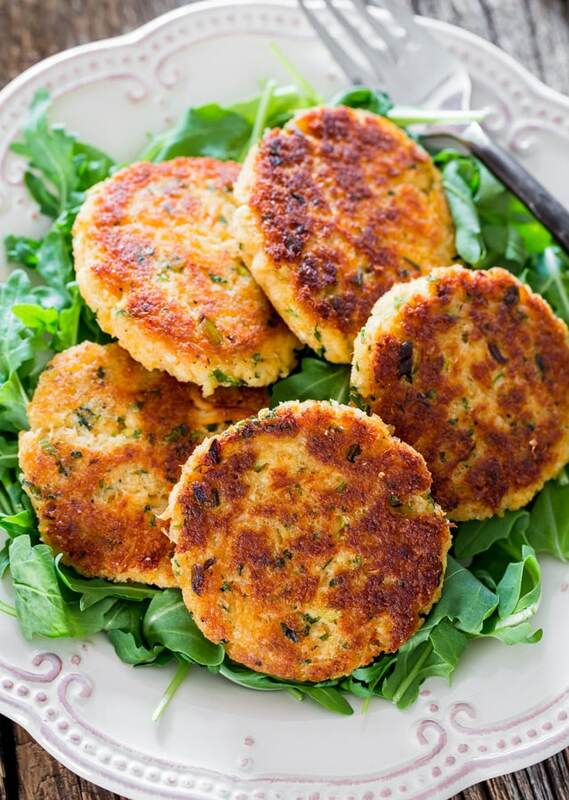 Crab cakes are a variety of fishcakes popular in the United States. They are composed of crab meat and various other ingredients, such as bread crumbs, mayonnaise, mustard eggs, and seasonings, particularly the cake is then sautéed, baked, grilled, deep fried, or broiled, and then served. I love to add a little hot sauce to mine for a bit of spice in them, lots of green onions, an egg and some breadcrumbs to hold them together, some parsley and mayo. That’s pretty much it to the recipe. Easy peasy! Just be gentle with the crab as you mix it all together and form it into patties. I chose to fry mine here, but you know what? I’ve baked these before and still just as yummy. Feel free to make a double batch too, just double all the ingredients and enjoy! Yes, you can! To freeze, place the uncooked cakes on a baking sheet in the freezer just until firm, about 2 hours. Wrap each cake in plastic wrap and place in a plastic freezer bag. Freeze for up to 1 month. Defrost the crab cakes in the refrigerator overnight before cooking. These delicious and Easy Crab Cakes are simple to make, ready in no time, crispy on the outside and tender on the inside. These succulent pan-fried crab cakes are fast, easy, loaded with flavor and won't crumble when you fry them. Add all the ingredients (except the olive oil) to a bowl and gently mix it all together. Form the crab mixture into patties, depending on how big you want the patties, I got 10 patties out of my mixture. In a skillet heat the olive oil over medium heat. Place the patties in the skillet, a few at a time, I did 5 at a time, and cook until golden brown, about 5 min per side. Gently flip them over and cook for another 5 minutes until golden brown. Repeat with remaining patties. You can bake these crab cakes as well, simply preheat your oven to 375 F degrees and bake for about 15 minutes or until golden brown. 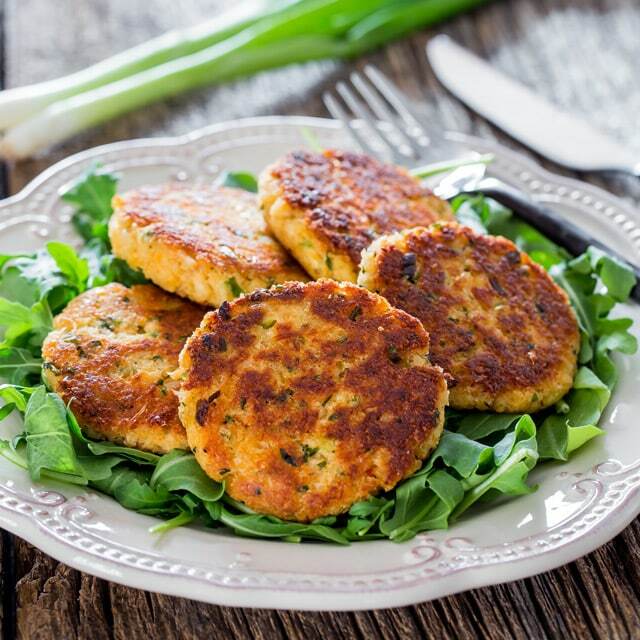 Nutritional information is per 1 patty based on 10 crab cakes for this recipe. Please keep in mind that nutritional information is a rough estimate and can vary greatly based on products used. I baked mine and they came out awesome. Thanks for the recipe. Jo, these sound perfect! My sister and her daughter and I and my daughter are going on a limo ride to look at Christmas lights and this sounds like a fabulous bring along with the wine. Speaking of my daughter – YOU are NOT crazy, my daughter has 2 trees – one real (the formal one decorated with white lights and silver and gold ornaments) and the casual one which is artificial with colored lights and has all of her ornaments she has received over the years. Do it up! Jo, these look absolutely wonderful! They remind me of the crab cakes we get in Maryland every summer on our drive to the beach. Delicious! Have you ever tried canned crab meat? It is very difficult to get fresh crab meat here!!! If so. any suggestions on brand name? Yep, I have made these with canned crab meat. I use Clover Leaf. Hi Jo. 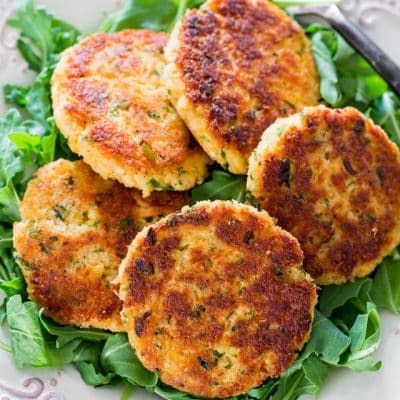 This is a great crab cake recipe! 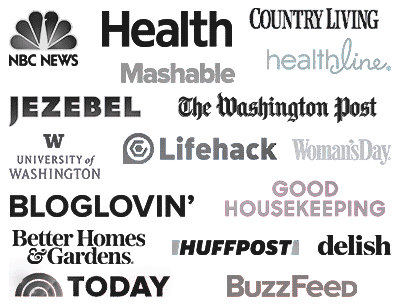 Being a Marylander we take great pride in our crab recipes! I have a suggestion for side dishes that may be of interest to some. We usually serve coleslaw and some kind of simple potato, for example garlic mashed potatoes. In our family we also serve dipping goodies such as horseradish sauce, garlic clarified butter and lemon juice. Hope you try some of these. They are REALLY good! Great post. I’m also a Marylander, where crab cakes are almost a religion, and I concur with your assessment. This recipe from Jo is great because it calls for just enough breadcrumbs and egg to keep the cakes from breaking apart as they are turned over in the skillet. We also stir a tablespoon or so of Old Bay seafood seasoning into the mix, before forming it into patties, but I understand the further one resides from Maryland the harder Old Bay is to find in grocery stores. Damn shame. BTW: I was once served crab cakes with a light, lemony hollandaise sauce on top and the combination was unexpectedly great! Love the idea of the lemony hollandaise sauce!! I live in South Florida. I wouldn’t be without Old Bay. In fact, I’ve even seen it in a low salt variety. Not my choice, but some people prefer it. These crab cakes were wonderful! When I first got married 23 years ago; tried to make crab cakes and they were a complete disaster. I haven’t tried since! LOL! I’ve been craving them; so I gave this recipe a shot! They were so quick and easy to make and they did not fall apart at all. The green onion is so good in them. I did need to add more spice as I am from Louisiana and we like spicy, but otherwise; this is a great recipe! OMG! These were amazing!!! I used avocado mayo. So easy and definitely a keeper- Thank you!! Just made these this evening. Great recipe that I will use for the future. I also made a second batch but substituted in salmon and they were also incredible. Tha ks for sharing. Just got finished making this for a family gathering. I added a little bit of chopped celery to it also and everyone loved it. Great recipe! I plan on making this more often. So happy you guys enjoyed it! I don’t live where fresh crabmeat is available. Will the imitation stuff in the refrigerator section work? I didn’t have fresh crab meat either, so I used the canned crab. I would use canned crab over imitation crab, since the imitation crab is not really that flaky. if you live near a Cosco they have large tubs in their chilled seafood section.. If you do manage to find some remember ti squeeze any liquidvout of the crab meat before you use it. I made these tonight, minus the hot sauce, added a little fresh garlic and they were DELICIOUS!! 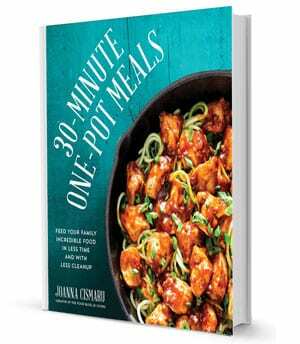 This recipe was a hit at my house. Delish as always 😋. Thank you for sharing! Hi Jo, I will be making these next week but would like to know if I can freeze the patties once prepared (uncooked) ? Do these crab cakes freeze well? 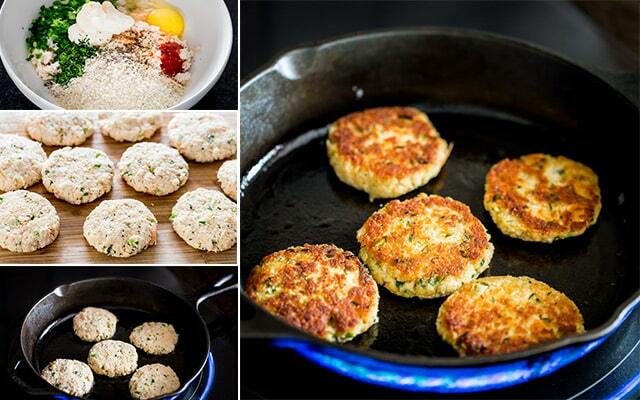 I am going to try these, I love crab cakes! Thank you for the recipe! I had crab cakes like these in a restaurant and their finishing touch was to add freshly made garlic chips and serve the cakes and chips on linguine with a garlic sauce (but not a swimming pool of sauce..just go light on it.) I finally got my garlic chips correct: slice fresh garlic cloves about 1/8 ” or so thick. Using a small sauce pan, add oil so you can “deep fry” the sliced garlic and bring up the temp on the oil just as you would do for french fries. Fry a few chips at a time and remove with a spider or slotted spoon and put on a paper towel to remove extra oil. These fry up very fast so don’t try to do anything else but stay with them. These will be part of my Mother’s Day meal tomorrow, can’t wait! OMG, I am sorry, I read the end of the recipe and saw the answer.